When Mitch was home on hospice, his elementary school rallied together and made him a get-well DVD. Contained in this video were messages from friends, students, and faculty who wanted Mitch to know he was missed and above all, loved. The final commentary (as seen in this screen grab) was from the former principal, Mrs. Shelly Davis, who had recently transferred to a different school across the valley. The loving souls who made this video went out of their way to include her, and her loving comments made a deep impact on Mitch. There is something quite special about this Principal. She leads with love and authenticity and exemplifies the principle of servant leadership. In every way, she was a tender mercy to Mitch, and I thank heaven she was part of his journey and made a difficult path a little less bumpy. 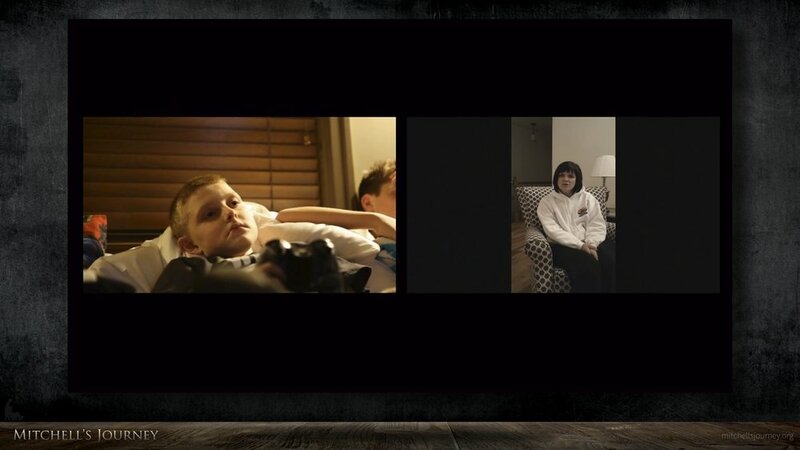 When we showed this video to Mitch for the first time, I turned my camera toward my son so that I could capture his reaction to the video. It starts out sweet but gets progressively more tender. Toward the end, you’ll witness a sacred conversation between my son and me. Every time he looked in my direction, he noticed my eyes pooling with tears, especially when Mrs. Davis came entered the frame. There was a point near the end this video Mitch looked at me with an expression as if to say, “I’m not going to make it back to school, am I, Dad?” When he gave me that look, the floodgates opened, and tears began streaming down my neck. Thus, began the delicate conversations and the careful unraveling of Mitchell’s fate. This video is as close to a conversation with Mitch that I’ll ever have in mortality. The way he looks at me melts my heart, yet breaks it at the same time. I loved this little boy so much, and it broke me to see him slipping through my fingers like a baby made of sand. I remember kneeling before my Father that night, pleading for my son to be delivered from death; but if not, that we would have the strength to carry such a burden. I wet my pillow with tears that night like I did the night before, and the night before that, even to infinity. Over the next few weeks, I learned to acknowledge my son’s inevitable fate while learning to say, “But for now …” Most painfully, I became a student of hardship and sorrow, learning to let go of tomorrow and live in the moment. I’m not the first to write about such things, and I certainly won’t be the last. In many ways, learning to live in the moment is a personal journey, and the lessons therein are layered. Most often, we learn this lesson over a lifetime. Perhaps what is why grandparents, rich with experience, savor their grandchildren so. Thankfully, I’ve discovered, there is an end. It isn’t because grief goes away (it doesn’t), but our backs will get stronger and, with heaven’s help, our burdens will seem light. Today, I experience more peace than pain, but as sure as the sun will rise and set each day, so will the cycles of grief return with its associated darkness and sorrow. But for now, I’ll enjoy the peace heaven has afforded me; and when darkness returns, as it surely will, I’ll look heavenward and count our tender mercies, like stars in the heavens. However dark the path may seem, there is always evidence of heaven’s hand, once before unseen.